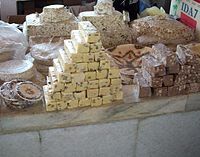 This variety of halva is produced and served in India, Afghanistan, Nepal, Pakistan, and surrounding countries (different versions of it are also found in Albania, Azerbaijan, Bangladesh, Bulgaria, Cyprus, Greece, Kosovo, Montenegro, North Macedonia and Turkey). It is usually made with wheat semolina, sugar or honey, and butter or vegetable oil. Raisins, dates, other dried fruits, or nuts such as almonds or walnuts are often added to semolina halva. The halva is very sweet, with a gelatinous texture similar to polenta; the added butter gives it a rich mouth feel. 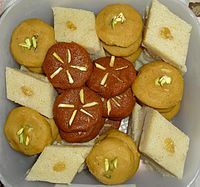 The standard proportions of semolina halva are: one part fat (a vegetable oil or butter), two parts semolina, two parts sweetening agent (e.g. sugar or honey), and four parts water. The semolina is sautéed in the fat, while a syrup is made from the sweetener and water. Then the two are mixed carefully while hot, and any extra ingredients are added. At this point, the halva is off-white to light beige, and rather soft. Depending on recipe and taste, it can be cooked a bit further, which makes it darker and firmer, or left to set as is. In Iran, halva(حلوا) usually refers to a related confection made from wheat flour and butter and flavored with rose water. The final product has a dark brown color. The halva is spread thin on a plate till it dries into a paste. Halva usually is served at funerals and other formal ceremonies, often with almonds or coconut shavings on the top.